US Postage Stamp Increases Price to 44 Cents! Today’s two-cent increase is the 23rd change in the price of a first-class stamp since the 1-ounce standard for postage was adopted in 1885. 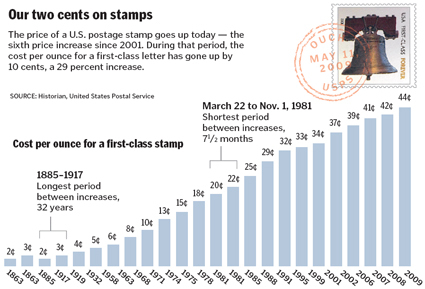 The price of a stamp has gone up 10 times since 1988. The Postal Service is an independent federal agency and covers its expenses not with tax money but with the sale of stamps, postage and postal services. The best-selling postage stamp of all time? More than 900 million breast cancer research stamps have been sold since the stamp was unveiled in 1998. A distant second is the Elvis Presley stamp (517 million), unveiled in 1993 and no longer available. Even as first-class mail has dwindled, philatelists, or stamp collectors, have watched their market thrive, thanks, in part, to the Internet and auction sites such as eBay. The stamp-collecting market reached a record $1.18 billion in sales in 2007. If it the Postal Service were a private sector company, it would rank 26th on the 2008 Fortune 500 list, just behind UnitedHealth Group and just ahead of Kroger and Boeing. For the fifth year in a row, Americans recently ranked the Postal Service as the “most trusted government agency,” according to a survey by the Ponemon Institute. The Postal Service was labeled trustworthy by more than 87 percent of the public. The least-trusted agency? In recent years, that distinction has gone to Customs and Border Protection and the National Security Agency. Is Kerry spending all this time on stamp talk? Yes. I know. It’s odd. But I find it interesting that the USPS lost $2.8 billion last year. The economic downturn has really hurt the post office. Moreover, email has caused massive drops in the use of snail mail since the late 1990’s. Furthermore, online bill payment systems have also caused a massive decrease in mail sent via the Postal Service. The lesson: Don’t mess with the Post Office. 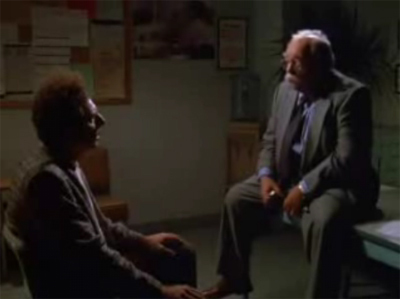 They will bring Wilford Brimley to confront you in a cold, damp room with poor lighting. And he will intimidate you with his awesome mustache and his fancy title. In all seriousness, 2007 was a decent year for the USPS. They processed 212 billions pieces of mail, but they believe that 2009 will be down about 17% from 2008. And after losing $2.8 billion in 2008, the 2009 forecast does not look very good. Postmaster General John Potter is calling for Congress to cut back mail delivery from 6 days a week to 5 days a week. They also plan to reduce the employee positions by about 15%, and there is currently a hiring freeze. They are not going to fill any positions at this time. Awesome. That’ll help me get through the post office lines more quickly. Pause. Not! I guess increasing the price of stamps and cutting costs will help them get back in the black. Good luck and godspeed, USPS. I’m thinking you’re gonna need it.